Heartland Alliance is in the hope business. When we see a population or place in need of help, we step in to provide housing, healthcare, jobs, justice – and a chance to hope again. So where does that hope come from? Heartland Alliance finds hope in the future – future projects, future outcomes, and the young people already making the future a bright one. 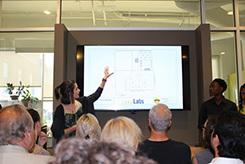 In partnership with Heartland Housing and Enterprise Community Partners, the architecture and design firm Landon Bone Baker Architects developed its cityLab 2017 cohort with a focus toward revitalization. As the previous school year ended, LBBA selected five high school students and three college mentors for an in-depth research project focused on the redevelopment of the former Calhoun Elementary School into supportive housing. For six weeks, the interns had an opportunity to observe the site, meet with partners, develop architecture skills, and present their findings. Over the course of the summer, the young designers poured over detailed maps of the neighborhood, assessing access to community needs like healthy food options and public transportation. They spent afternoons meeting with community members, conducting interviews and developing a better understanding of a community-based approach to design. In the end, this team of dedicated teenagers was able to develop an asset map of the surrounding East Garfield Park neighborhood, design a new layout dedicated to providing supportive housing in the closed school, and develop partnerships with nonprofits that could potentially provide services to the neighborhood. These young people have inspired more than just our Housing team – they have inspired a community. We look forward to our next steps in East Garfield Park, and to the futures of these bright students!